Yes, on topic. I know, just typical TV show about fixing cars for stupid money. But, Episode Red, Hot and Dangerous features a Manta. Upon a test drive, something went oops. Upon teardown they discover the throwout bearing snout has broken off from the differential. they make a big deal over how they need another whole differential assembly, and they are rare. Funny, I recognized the part right away. Yep, 66-69 Corvair transaxle. They just need to order C7463 and a few seals....gasket set. I wonder how many horsepower they are going to try to shove through that transaxle? Yes, I saw it too and thought their comments were interesting. As long time car guys in the Vegas area, you'd think that they would know some Corvair folks there. Chuck P.
Everything that was said or done was in the script. Nothing on any automotive reality show is real life. Even the good ones are scripted from start to finish. I watch Counting Cars from time to time and often notice how incorrect these supposedly educated car guys often are about simple stuff that should be general knowledge. A good example would be calling a 1969 Camaro a 1968, or a 1967 Mustang, a 1966. I have also heard on at least one occasion, someone calling Danny aka The Count by another name and he responded to it. It kind of make a person wonder. When I watch shows like this, I keep in mind it is entertainment and not a documentary so when these errors occur, I simply shake my head and chuckle. You mean Daniel Nicholas Koker II? Yes, just another pure entertainment show. Most time I am watching to see what great car they modify into something I don’t like. I do like to see the fancy paint work, as we used to paint bikes with House of Kolor stuff, trying alll this lace, wood grain, flames, etc, etc, etc. I did not have any one who could air brush murals or portraits, though. 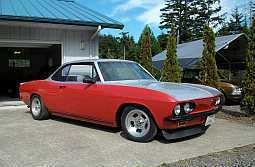 So that Manta looks like it was built on a Corvair. Yes? And sure they made a stink about it being rare--for the cameras--but I have broken down in Las Vegas and been able to get my Corvair repaired, so people know those cars, no matter what he says. Do they get a transaxle in the episode? Episode ended with the usual delivery of a finished car or motorcycle for a customer. The Manta was a project of Danny's, so it is continued to the next episode. 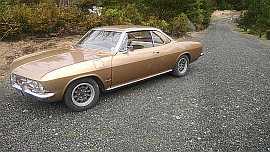 Only the transaxle was Corvair, engine is small block Chevy in Manta on show. Funny part was all the rocker switches to the left of the driver. Might have been 25 of them. The comment was "switches to turn on more switches?" If I remember correctly Danny was talking about putting a 383 stroker motor in it.